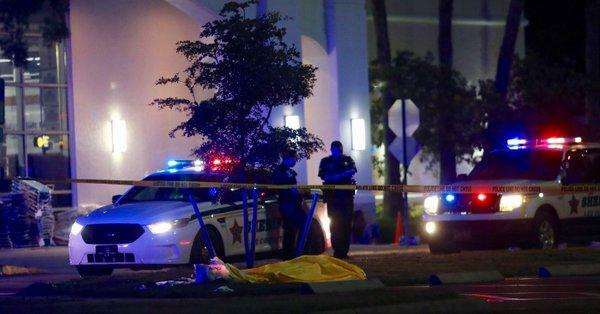 The Lee County Sheriff’s Office confirmed that a shooting on Tuesday night at the Bell Tower Shops in south Fort Myers left two people killed and two others injured. Lee County Sheriff’s Deputies say they received calls of shots being fired around 9:30 p.m.
Sheriff Carmine Marceno also said that the shooting did not appear to have been carried out in random. Marceno, however, provided no other details. Before the shooting, everything was normal and busy as usual for the establishments in the area and the shoppers. Witnesses say the peace was disturbed when they heard several shots from nearby bars and restaurants. In the aftermath of the shooting and all the chaos, a yellow tarp covering a body could be seen in the grass just outside of Bed, Bath & Beyond. Nearly four rows of the parking lot fronting Bed, Bath & Beyond were cordoned off by police tape past midnight as moviegoers and late-night patrons at nearby restaurants scrambled to their vehicles to go home. There were spectators near the sectioned area who appear to be there out of personal concern and not just out of curiosity, as if they were awaiting answers from the deputies. They, however, declined to speak with the local media covering the incident. Just after the shooting, a woman was seen hyperventilating as she speaks with someone on the phone. Another woman was also seen holding tight to another woman. She was overheard calling her mother and saying, “I’m sorry, Momma. I’m so sorry.” Authorities approached the women to talk to them in private. Deputies have yet to give further details about the shooting, who are involved and the motive behind. They say they are still investigating matters. The deputies are also asking the public’s help for any information about the incident, especially from those who were in the area when the fatal shooting took place. Sometimes I wonder if the Socialist-Democrats are recruiting terminally ill people for $,$$$,$$$/jobs for their families, or inciting Nut Cases they get a heads up from Liberal Head shrink doing their therapy . Why all these shooters just before the Mid-terms and later during the National elections?